Whilst manufacturing textile products to Oeko -Tex Standard 100 is a reliable way of ensuring that no harmful chemicals are used in the production our textile products, it is important to remember that most fabrics are treated to some degree with chemicals for various purposes. Many fabrics have residual starches from the pre-weaving yarn preparation stage and some can be treated with a lubrication coating to reduce friction, as they travel through various machines in the manufacturing process. In reality, these chemicals are not known to be harmful to humans, however we take a very cautious view, particularly for babies and adults with sensitive skin conditions. It is fair to say that some businesses selling textiles are not as stringent with the quality and safety in textile standards that Canningvale has, and for this reason we recommend that our customers be on the safer side by carefully washing them with our easy instructions. We always recommend a cold/warm wash, as it is very rare for towels to get dirty enough to warrant a high temperature. Most high quality towels use fine cotton fibre in the loops, it is best to consider treating a premium towel with the similar care as any fine cotton garment. Higher temperatures, such as 60 degrees or above, can increase the likelihood of shrinkage in a towel, it can also dull some colours over time. Also, never wash towels with fabric softeners, as this will inhibit their absorbency. Occasionally, say once per month, add 1 cup of plain white Vinegar (not wine vinegar, cheap home brand is good) to the rinse or wash cycle. (the addition of vinegar changes the Ph of the water and will result in softer fresher towels). If you have a top loader, dilute the vinegar first in a small bucket of water. Colour discolouration occurs over time if towels are left in direct sunlight. Direct and extended exposure to sun light can destabilise certain dye stuffs at different speeds. Testing is done during production called ‘Light Fastness’ which can identify towels which have poor dye fastness, these may be then removed and re-dyed. Tumble drying towels on low heat will allow the towels to be become extra fluffy and soft. This process assists in moving air throughout the towel increasing the level of absorption and loft. Unfortunately we are seeing a growing trend amongst our customer’s complaining about random bleach stains or discolouration on towels. About 99% of the time, this chemical degradation is caused by a house hold cosmetic product, anti-moulding agent or toothpaste, as they often contain benzoyl-peroxide or other active agents. Exposure to bleach or benzoyl-peroxide in itself will not bleach your towels, however adding warm water to the mixture will commence the chemical reaction which leads to discolouration. Greys and browns use very similar pigment recipes in dyeing and also have a similar reaction when exposed to bleaching agents. The exposed fabric or area will turn orange. If you know that your towels have been exposed to bleaching agents, we recommend you immediately cold rinse the area affected to try and remove as much of the bleach or bleaching chemical prior to washing. This may not always save the towel, however it will minimise the damage. After washing your towels make sure they are completely dry before you put them away. 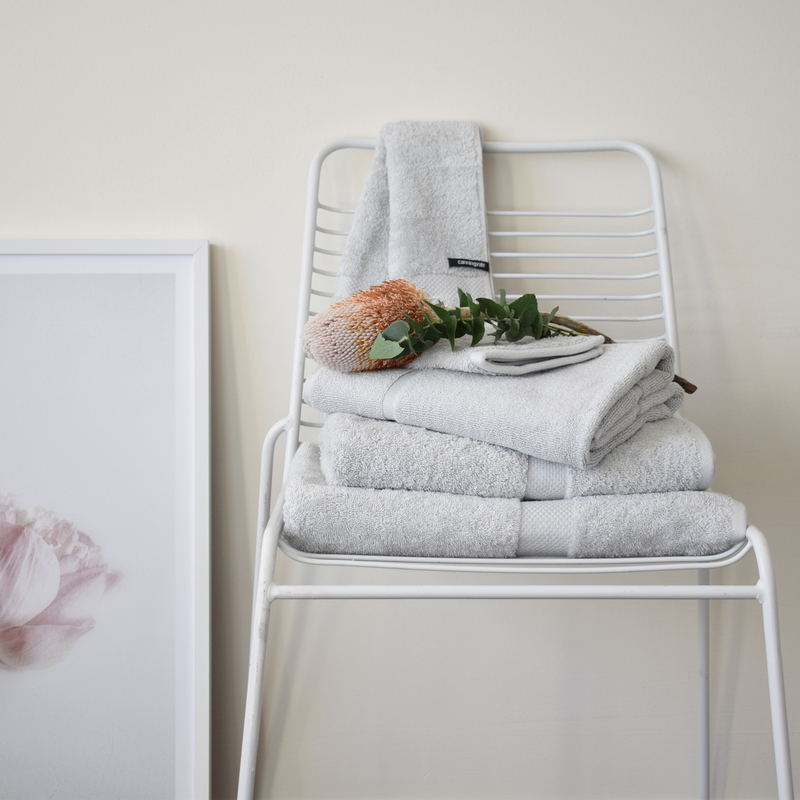 Store in a clean, dust-free place on a flat surface and away from direct sunlight which could cause discolouration and permanently mark the towel. Ideally, you would have a linen cupboard but there are plenty of other places you can store it. Drawers under the bed, airing cupboards with lining on the shelves to avoid marking the towels, etc. It is always a good idea to store towel sets together in separate piles, makes it easier to grab a set when you are in a rush.